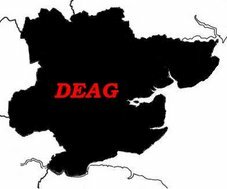 2mm Darkest Essex Area Group: Farewell then . . . . . .
Farewell then . . . . . .
No the blog is not going anywhere! On Thursday the DEAG bid farewell to Nick Mitchell who is moving to foreign parts, well the Lancashire / Yorkshire borders to be precise. Nick came to the DEAG a novice scratch builder and I think it is fair to say we have all been impressed with the quality of his 2mm modelling, see elsewhere on this blog. He brought along and was working on his 2mm Scale Association's 08 kit which is posed on 'Clive Road Sidings'. It runs very smoothly even without the weight of a body, a testament to both Nick's skills and to the quality of the kit. David Eveleigh is currently working on making a mould to produce pantiles for a row of buildings which will appear on his layout Cley Harbour. He has made a grooved roller which he drags across a sheet of rolled out FIMO to form a positive moulding which is then fired in the oven. RTV silicone mould making and casting rubber will then be poured over this to make the final mould from which resin castings will be produced. In the photo, David is cutting the FIMO into strips so that they can be laid on plastic card, each strip slightly angled upwards to give the effect of tiles overlapping. Stuart Bailey was working on a model of Lambourne goods shed. It is built using Evergreen 'siding' board and plastic card strips, the contruction mimicking how the original shed was built. David Short has been building the point work for his Golden Jubilee Challenge layout based on Goathland, and the photo shows a single slip and point being constructed using the Versaline track building system (other systems are available). The layout of the track work was created using Templot (c). The chairs are soldered to the sleepers which are stuck onto the plan using a water soluble glue for easy removal when finished. The next step will be soldering the rail on. It may look chaotic but room on the modelling table is at a premium, still it makes for a cosy atmosphere. As for me I was adding grab handles to my GWR four wheeled coaches, built from Worsley Works aid to scratch building kits. The handle etch is an Ultima Model's one which I bought many years ago. A handle is laid in position on some solder paint, held lightly in place with a cocktail stick and I use a resistance soldering iron to complete the attachment. A fibre glass brush will remove the surplus solder. The inclusion of links from this post to products or services implies no recommendation and their inclusion is for information only.